Last month, American watchmakers JORD approached me to review one of their gorgeous wooden watches. Being the daughter of a carpenter, I've always had a thing for beautiful wood, and I also love analogue clocks and watches (nothing beats the sound of the ticking second hand as you're drifting off to sleep if you ask me!). I have lots of different pieces of wooden furniture in the house; some smart, some rustic, all from different kinds of trees and with different finishes - and I love them all. 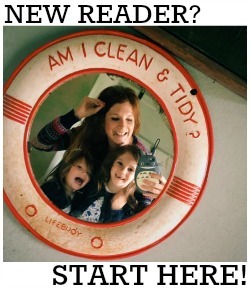 You'll also often find me or the kids posing in front of a distressed wooden backdrop over on my Instagram. Wooden watches were things I'd never really considered before! 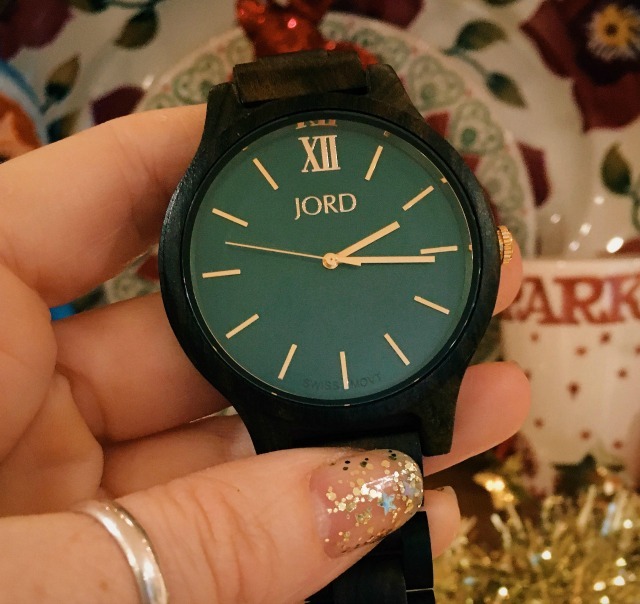 I chose the Frankie in dark sandalwood + emerald from JORD, which retails at $189 (that's £149 to you and me, plus shipping is free to the UK) and fell head over heels in love with it the moment it arrived. The packaging impressed me before I even got to see the watch itself; it came inside a beautiful solid wooden box, presented on a hessian cushion. 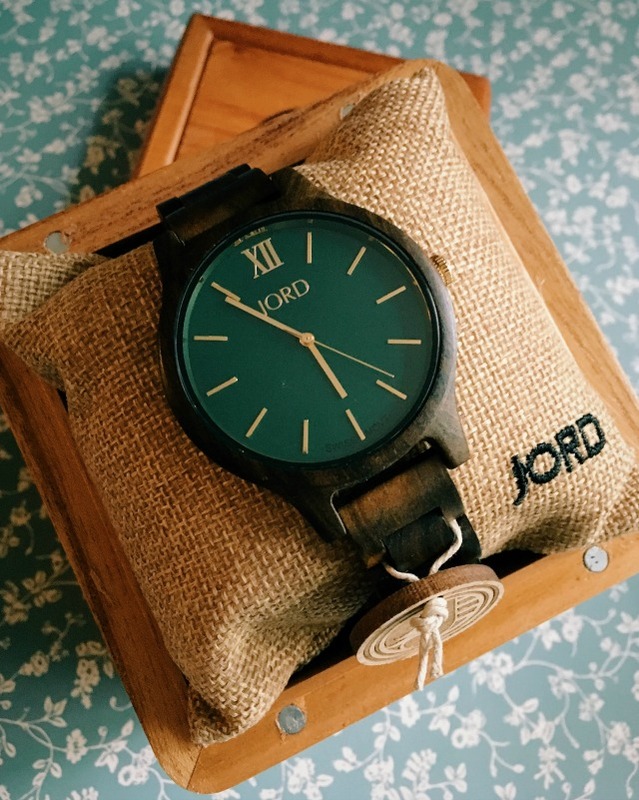 It goes without saying that the watch really is something special; the grain of the dark sandalwood strap is just gorgeous, and that huge, vibrant emerald green watch face really is perfection. I'd wanted an oversized watch for forever but didn't want to buy anything too similar to anything I already had. This couldn't be more different to my leather and metal watches! JORD watches are made to measure so my watch arrived ready to wear and, despite it's size, it really is super lightweight compared to my metal watch. Being a natural material, it's also really kind to the skin which is an added bonus when wearing something so large. It has a metal clasp with an easy to use locking mechanism - and I absolutely have to mention the fast, free delivery to the UK. Mine arrived in just six days which is pretty incredible! Be warned though that you may incur an additional customs charge - I had to pay £13.65 to collect mine from the sorting office. 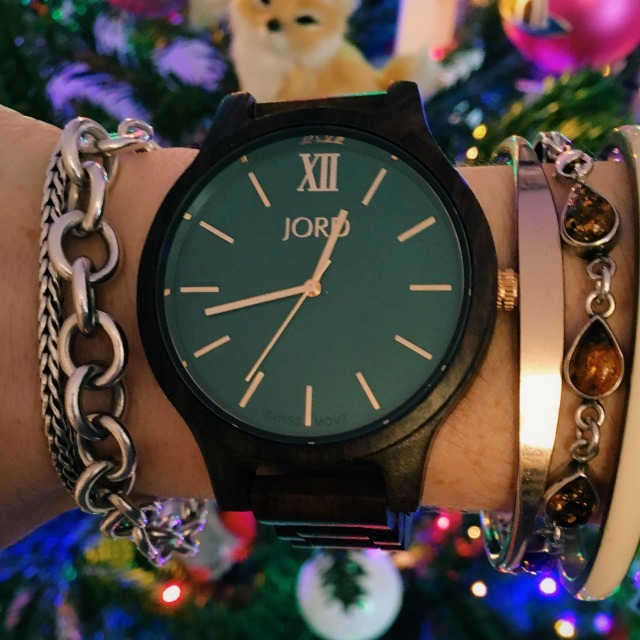 JORD are also hosting a brilliant giveaway at the moment - to win a $100 e-gift code! - which you can enter here. All entrants will receive a $25 e-gift code, so everyone's a winner! The contest will close at 11:50pm on 15th January 2017. All gift codes will expire on 31st March 2017.